Detroit is often referred to as an example of a city in which citizen effort and innovative design in certain areas have increased the standard of living, despite the city’s overall struggles. The Eastern Market district is an example of such uplift. In the five long, 19th-century “sheds” along Russell Street, cafés, local farmer-vendors, jewelers, and Coney Island–style hot dog stands now flank the corridors. Murals on brick brighten up the exterior walls. Jazz musicians and Motown singers play music for guests every Saturday when the markets are at their liveliest. Outside the sheds, there are local coffee companies, clinics, restaurants, and grocery stores. In recent years, the space, a 24-acre plot in the heart of Detroit, has been dramatically revitalized. The bustling marketplaces reflect this. However, it is clear that more effort is needed to make the most of the possibilities the district offers. 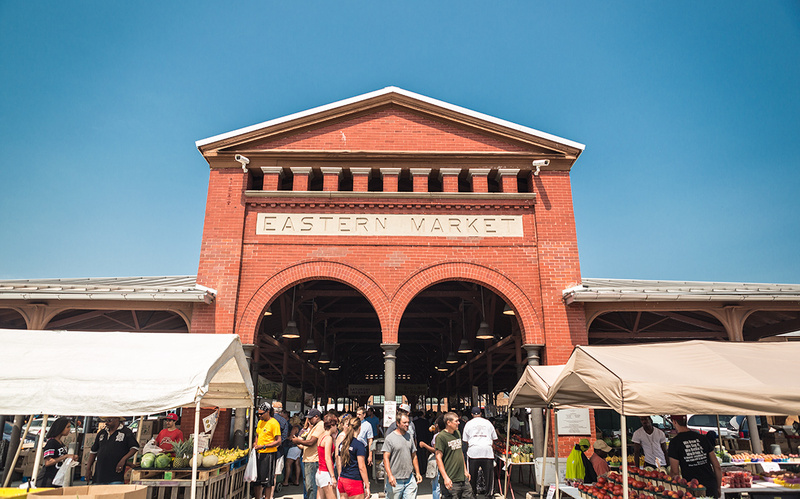 Today, the Eastern Market’s historic core requires both structural and environmental updates. Additionally, an increasing number of visitors means the sheds and surrounding businesses require expansions. In a group effort by the Detroit Economic Growth Corporation, the Eastern Market Corporation, and the Nature Conservancy, Boston-based firm Utile, Inc., and Michael Van Valkenburgh Associates (MVVA) have been commissioned to lay out a comprehensive framework for the district and the surrounding neighborhood. In doing so, the district hopes to become a larger center for food distribution. Further goals involve becoming a high-tech hub in order to present more opportunities for employment. Tim Love, principal at Utile, spoke to The Architect’s Newspaper about the challenges, plans, and aspirations for the project. The Architect’s Newspaper: What were the guidelines for the project and the issues present that the client wants to solve? Tim Love: The project has two separate but related focus areas: the historic core of the market, centered on the market sheds, and an area targeted for the expansion of food industry businesses to the north and east of the existing market district. The expansion of the market is necessitated by new federal food regulations triggered by the 2011 Food Safety Modernization Act and the desire by the City of Detroit to retain and expand the job opportunities provided by the food industry. The plan for the market expansion area required the thoughtful integration of an industrial real estate development strategy with a centralized stormwater management plan. As a result, the Utile/MVVA team needed to test alternative food business building prototypes and the network of open spaces that threaded between the buildings. 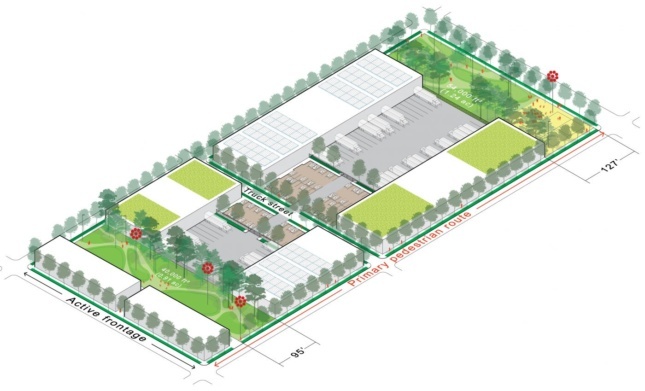 The design problem was complicated by the need to provide truck access to the food businesses while screening the truck aprons from non-industrial uses on the boundaries of the expanded food industry district. The final recommended urban design strategy, conceived at the block scale, weaves together industrial buildings, stormwater greenways, truck aprons, pedestrian and bicycle-friendly streets, and live/work building types. The net result is an urbanism that acknowledges the need for large-footprint, truck-dependent buildings, but organizes them in a way that makes for a more environmental-friendly and walkable district. The plan for the core market area meets related but slightly different goals. In this case, the preservation of the market sheds and the funky building fabric on the blocks to the east and west of the sheds were identified as a cultural as much as a historic resource. As a result, a set of design guidelines were developed that encourage developers to preserve the existing buildings while allowing for penthouse additions of three to four stories above. To reinforce the existing ad hoc character of the district, we decided to embrace the mismatched stacking of contrasting architectural expressions rather than encourage a more canonical restoration of the historic fabric. Along the Dequindre Cut and Gratiot Avenue, where less of the historic fabric survives, dense residential mixed-use development is proposed. 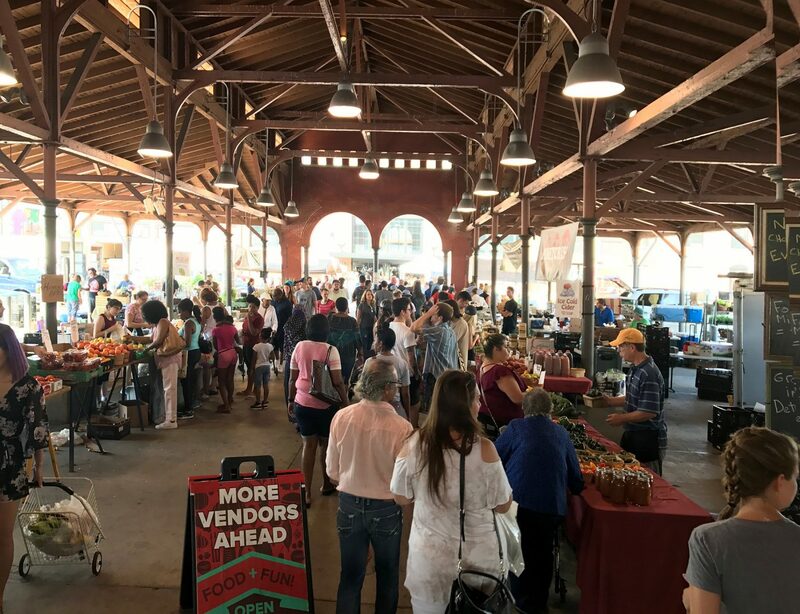 An increase in the local residential population will enliven the public realm, especially in the evening, when Eastern Market is mostly deserted. The twist, in this case, is that fabrication and light manufacturing spaces are encouraged on the ground floor rather than retail. The goal is to encourage smaller-scale food and fabrication businesses that complement the larger-scale facilities being planning in the market expansion area. In addition, favoring fabrication spaces over retail will help steer retail businesses closer to the market sheds, where food-focused retail already benefits from the busy public market. Our team is still working with the city to determine how our plan will be implemented, both in the short- and long-term. Certainly, zoning regulations will be one tool that will be used to shape future private investment. AN: What is the current state of the Eastern Market neighborhood, and where does your team envision it being when your design has been implemented? How will your team’s designs impact Detroit on a city-wide scale? TL: Today, Eastern Market neighborhood is an island of walkable urban fabric within a larger landscape of vacant parcels and auto-centric uses. The economy of the market core is defined by symbiotic relationships between food production, distribution, and retail businesses in close proximity to one another and in connection with larger supply chains. Our goal is to extend the district to accommodate the needs of the modern food industry while introducing a mix of uses that reinforce the public realm and increase both the daytime and evening population. The expansion of the market district will also increase the number of food industry jobs, important in a city where the largest areas of job growth have been in the customer service and retail sectors. The industrial buildings that surround the historic market sheds are not suitable for modern food processing and fabrication. Their floor plates are too small, and their ceilings are too low. And even if they were adequate in size, modern food safety codes make the buildings prohibitively expensive to renovate. To answer the need for modernization, a market expansion area was identified directly to the north and east of the core market where new larger state-of-the-art industrial building can be accommodated. As existing businesses move or expand into new facilities in the expansion area, the core market buildings can be renovated to support a mix of uses, including retail, commercial-office, loft residential, and smaller-scale food startups. New multi-floor rooftop additions are allowed per the design guidelines developed as part of the plan. The additions will increase density in the district and will cross-subsidize the rehabilitation of the lower floors. The expanded market area will both keep existing businesses from leaving the area and will attract new food industry businesses to Detroit. Preserving and enhancing the economic engine of Eastern Market not only creates jobs and generates revenue for the city, but also a strategy for maintaining an authentic working market district. AN: How has the community been involved in the design process? What are some of the features of the final design that allow for and encourage community engagement? TL: We partnered with the City of Detroit and City Form Detroit, a local urban design and planning firm, to craft a comprehensive engagement strategy. The process included well-attended open houses hosted by the city that included short presentations, informal break-out sessions, and visual survey activities. As a sign of the city’s ownership of the process and emerging plan, representatives from the city and the Detroit Economic Growth Council gave the presentations and not members of our team; the first time one of our public agency clients has owned the content early in the planning process!